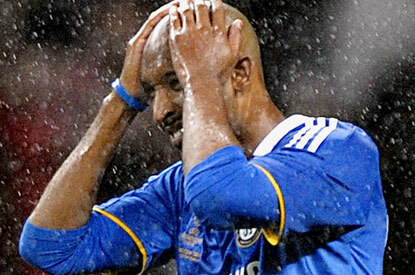 Nicolas Anelka's reaction after hearing YouTube hit "His name is Suheil"
Pharoahs midefielder, Suheil Dhirani, has become an overnight sensation after an obsessed fan known only as Mee dedicated what can only loosely be described as a music video to him. The video “His name is Suheil” uploaded to YouTube earlier in the week after Dhirani’s outstanding performance in Pharoahs goalless draw against Sand Eagles has already had over 3 million views. Pharoahs gaffer and older brother, Saqlain Dhirani, was less than impressed with his younger brothers new found fame and has called this an unnecessary distraction in the run up to their match with Taifa Stars. With classic lyrics such as “his name is danger like hell” and “his name is Suheil” this master piece is attracting a lot of attention in the music world with big names including L.A. Reid, Dr. Dre and Usher looking for exclusive deals. Music mogul Simon Cowell is currently favourite to purchase Dhirani’s image rights. Here’s the video for you to decide whether it’s a hit or not. As a fellow Pharaoh the distractions of one Suheil Dhirani are detrimental to the team. He is never on time and always smells of cheap perfume. I hope the gaffer does something about this even though Suheil has got skills much better than Saqlain. I asked him for a picture together to prove to my friends that I know him but he slapped me and said no. I think his fame is getting to him.